Finest Quality, hand made in Germany using a 172 step production process and with a keen attention to detail, this brown Breitling style watch strap is made from Russian leather with off white stitching. 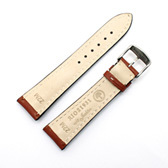 It is available in a range of buckle widths - 20mm lug with 18mm buckle width; 22mm lug with 18mm or 20mm buckle width and 24mm lug with 20mm buckle width. 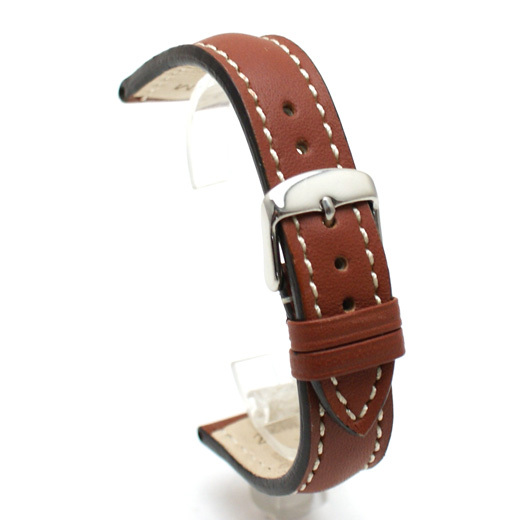 This strap is made from Russian leather, a bark-tanned cow leather that has an extra processing step after tanning. Birch oil is worked into the rear surface to produce a leather that is hard-wearing, flexible and resistant to water. Russia leather is most often used for straps on high end watches. 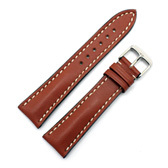 Buckle: stainless steel only; available in a range of buckle widths - 20mm lug with 18mm buckle width; 22mm lug with 18mm or 20mm buckle width and 24mm lug with 20mm buckle width.